This print is signed by Shepard Fairey only. It was available exclusively from the Upper Deck Store at a retail price of $349.99 unframed and $549.99 framed. 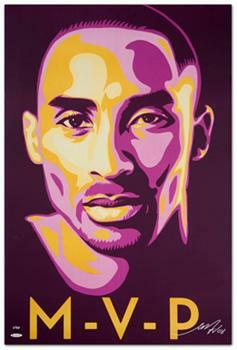 From the Upper Deck Store: Here is your chance to own specially commissioned artwork of 2007-08 NBA MVP Kobe Bryant, created exclusively for Upper Deck by Shepard Fairey, one of today's most prominent and influential artists. Noted for creative street art campaigns and iconic pieces of work - his Barack Obama posters were in extremely high demand during the junior senator's run for the 2008 Democratic presidential nomination - Shepard Fairey continues to make bold statements through his art. While a nearly 60-foot high version of this inspiring portrait of Kobe currently looks out on L.A. from the east and west side walls of the Henry Fonda Theater in Hollywood, you can pay respect to the reigning MVP with this 20" wide x 30" high unframed 'KOBE' edition signed by Shepard. Incorporating a rich mixture of Lakers team colors, the visually stunning lithograph is produced on French archival paper. Shepard's signature is guaranteed authentic through Upper Deck Authenticated's patented five-step process. Like other Shepard Fairey art productions, this rare, iconic litho isn't expected to last long. Order now!